Second pressing of their killer debut LP in collaboration with Dying Victims Prod.! International punks based in Berlin worshipping speed/thrash metal! 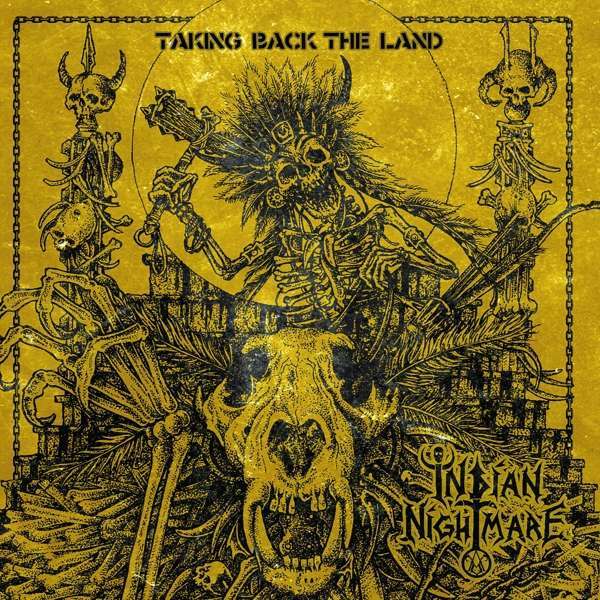 INDIAN NIGHTMARE was originally created in the spring of 2014 as Poison (Mexico) and Dodi (Indonesia) decided to form a powerful band with lifeblood to combine the furious soul of punk with the rawest form of early metal to live for METAL PUNK and to die. Half a year later and after a few changes in the line up, the band was finally complete under the name INDIAN NIGHTMARE. With Cedro (Italy) on bass, Lalo (Italy, ex-MINKIONS) on drums and Butch (Turkey) on guitar, there was nothing to stand in the way of the numerous live rituals that followed. Absolutely authentic and spectacular shows quickly made the band famous in the Berlin area! Due to the different countries of origin and the more than 10-15 years of experience that everyone brings with them, a completely unique sound and a stage performance with influences from all over the world was created, which is probably unique in the underground. Absolute recommendation for fans of Japanese punk, GISM, DEATHSIDE, GHOUL (jap), English Crustpunk, early Speed ​​Metal, DISCHARGE, AMEBIX, MOTORHEAD etc.